Colie Egerston was kind enough to email me with a fishing report. He yesterday hit one of his favorite small streams to seek wild browns and brookies. Unfortunately, water conditions were less than ideal in terms of temp and color. But, he may try again on Saturday. And, for me, I’ve been tying some flies. Here is the pattern that worked well a few days ago on the Farmington. In fact, there were no hook-ups on any other fly, only this one. It made me wonder if highly pressured fish respond better to a fly they’ve not seen before? If everyone is throwing Wooly Buggers and eggs, perhaps, throw a curve ball? 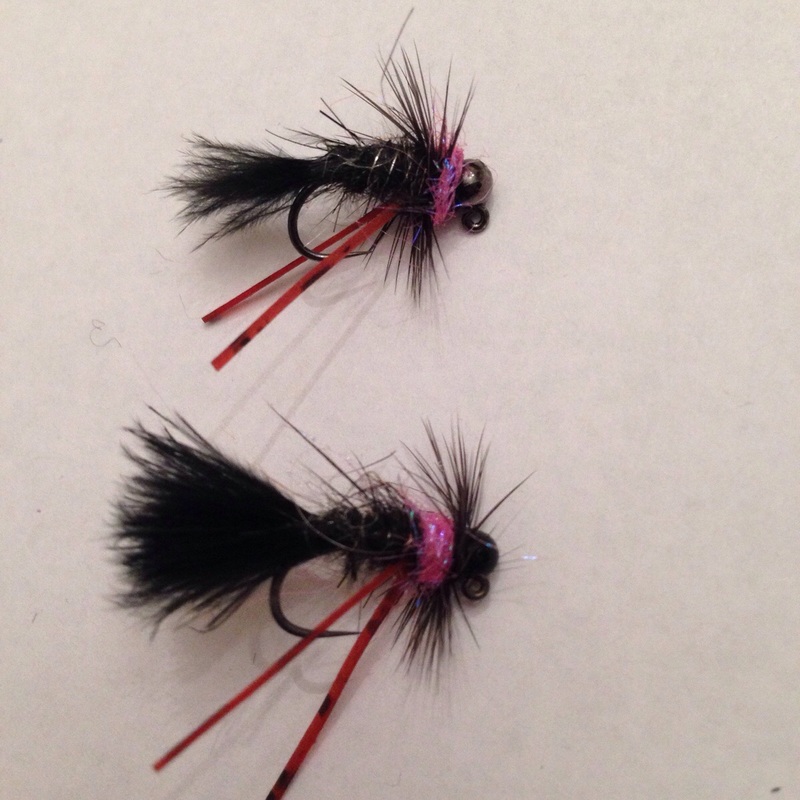 I’m calling the fly the “Marabou Nymph.” I guess it’s a cross between a streamer and a stonefly. So, a “fleamer”? It’s got a marabou tail and some hackle that give life-like movement, a buggy body, some color contrast via a hot spot, and unusual wings. I use a jig nymph hook, so that the hook point rides up, which helps reduce snags. For whatever reason, the browns I’ve caught have been on black fly patterns. That has been true on the Millers, Squannacook, and, now, the Farmington. I don’t recall that color taking ‘bows or brookies. Have you noticed that browns key in on certain colors? Looks like a nice stream! Right now they are very difficult to fish with the snow melt, however. I know rainbows are known for being attracted to black flies (black buggers), and brookies will go for black flies too, but brookies prefer bright colors. +1. On Saturday, a lot of bugs at the Farmington. I'd say 5x what was there the previous week. I haven't noticed browns keying in on particular colors, but I have found that brookies love red and yellow. Mickey Finns, Royal Wulffs, and Red or Yellow Humpies always work for me on brookies. Browns seem to favor more natural colors – which is probably why black works well.